Why watermark your images ? Images are integral part of any website.People compliment text on their website with images.Adding proper images to your page enriches user experience.It also improves post quality.Getting images relevant to a content is a challenging task.While writing a post I use images to make it easier to understand.In this post also you can see some images. Images are more prone to theft then textual content on your website.Search Engines are penalizing sites with duplicate copied content.So stealing text content has decreased.People aware of this penalty are not copying it in entirety.But I doubt if search engines can read and detect duplicate images.Also there are copyright free images which you can use on your website without any issue. So images are more prone to theft.Many people do not want to do hard work.They like the easy way out.They will take your image and post on their website.Since internet is vast it is tough to find where your image is being used.So they will claim your image as their own.You can stop this by adding information that this image belongs to you.This will help visitor know exact source of the image. Hotlinking is yet another way to use your images.Watermarking your images does not stop hotlinking.But it will tell the visitors of websites using your images the original source of the images.You can know more about hotlinking in this post. If you have added information that this image belongs to you then people using your images will avoid doing so. There are couple of reasons.First everyone will know they are using someone else work.This will harm their reputation.So the only way is to remove your information from the image.For this they need to work extra.It would require technical skill and time.This is the reason most people will not try using a image with information on it. The information you add should not overlay the image.The image quality should not be hampered.I prefer adding text to images.But many people use images.It depends on your choice.But adding images will increase size of resulting image.The information you add should be transparent.It should also have give visitor an idea about original source of the image. Generally I use my website name along with the copyright text.Sometimes for some images I drop the copyright text.I only use the website name.Instead of using whole copyright text you can use the symbol also.Watermarking is being used by most website. There are many paid tools to create watermark for your website.Instead of using paid tools I use open source tool called GIMP.GIMP is very powerful image manipulation software.In this post I would cover different GIMP plugins for creating watermark.You can download and install GIMP just like any other software.It is available for Windows,Mac and Linux operating systems.You can download it from this link for free. After downloading you can copy the file to .gimp-m.n/scripts folder.Here m.n is the version of GIMP you have installed.In case you have installed GIMP 2.8 then m will be 2 and n will be 8.The folder .gimp-m.n is located inside your user name directory located inside C:Users.In case you do not find the folder then your do not have hidden files view option enabled.You need to enable display hidden file option. After copying the file there start GIMP.You will find a new option Script-Fu.Under this option you will have MyScripts.Under MyScripts you will find watermark option.If you click on that option below window will be displayed. The above image has text udinra.com.This text was added using Watermark plugin of GIMP.The plugin is easy to use.But it does not offer support for adding images.You can also process one image at a time. 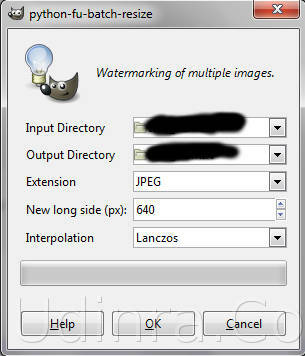 This plugin solves the limitation of the first one.But it may be bit complex for new users.It helps watermarking multiple images in a go.You can download it from this link.After downloading the file copy it to plug-ins folder inside .gimp-m.n folder inside your users directory in C:Users folder. After copying the files restart GIMP.You will see option BatchTools under Tools option of GIMP.Below window is displayed if you click watermark option under BatchTools option. 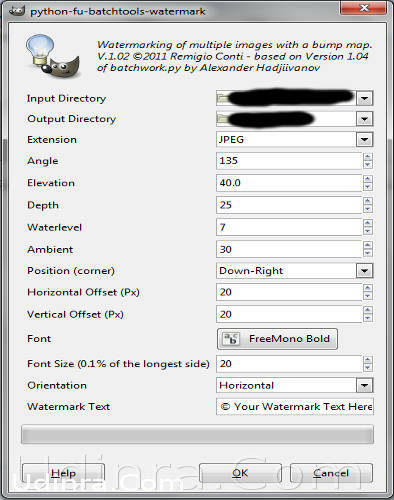 The other options like Angle,Elevation,Depth,Waterlevel,Ambient are used to control display of watermark text.You can leave them default level or change as per your requirement. 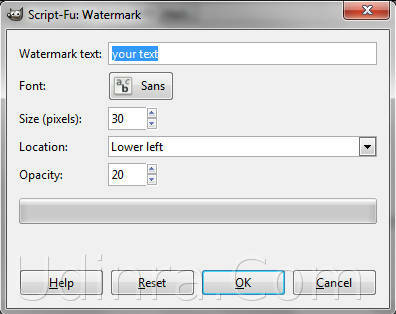 Position,Horizontal Offset and Vertical Offset – These options control the position of watermark text. Orientation – The position of text either vertical or horizontal. The plugin does not allow you to add images as watermark.Though it works great for processing many images at a time. The watermarking feature of this one is same as the second one.But it has one additional functionality of resizing the images.You can resize multiple images in one go.You can download the plugin from this link.After downloading it paste it in the same directory as mentioned for second option in this post.After pasting the file restart GIMP. You will see a new option BatchWork under Tools option of GIMP.There are two sub options.One sub option is resize for resizing the images.The second option is for adding watermark.Adding watermark has two option Difference Map and Bump map.You can try either one of them and see the result.The options displayed in both are more or less same as that of those discussed above (in second option). Above window is displayed if you click on the resize option.It lets you select the input directory,output directory and image size.So you can resize your images in one go.The images are resized in ratio of $:3.So you only need to give one dimension and second is auto calculated. I am pretty satisfied by these plugins.For individual image my preference is the first one.For processing multiple images then second one or third one both can be used.Both have similar functionality though third one has one additional option. Do share your thoughts on this.Are you using GIMP or some other software for watermarking your images. Been looking for this! Great help and great info.